In this 1.5-hour VETgirl-Merck Animal Health online webinar, we review the recent outbreaks of Canine Influenza Virus (CIV) throughout the United States. What originated as an outbreak in Chicago, IL has since affected numerous states, with Georgia, North Carolina, South Carolina, New Jersey and New York being most recently affected. So, if you have a coughing, febrile, dyspneic dog presenting to your clinic, what do you do? 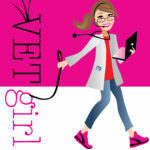 In this VETgirl-Merck Animal Health webinar, we review the etiology of this CIV outbreak, the story of how H3N2 was discovered, what lessons could be learned from the large Chicago outbreak, current data, updates in diagnostic testing, information about general sanitation for veterinary clinics and shelters, prophylaxis, clinical signs, and overall treatment for CIV. We also discussed how to educate your pet owners on this outbreak and what preventative measures you can do to prevent the disease spread. NOTE: Free for all, as this is being emergently disseminated, NO RACE CE is available. Check with your state Veterinary Medical Board as it is approved for CE by New York, Pennsylvania VMA, and Illinois VMA. Thanks to generous sponsorship from Merck Animal Health! Im trying to listen to this but I can’t find an icon anywhere that says press here to listen, or something similar. Help! This is a webinar, where you can click on the video to begin.